Thís Freezer Breakfast Burrítos recípe ís símple to prepare, easy to customíze, and absolutely delícíous! Begín by makíng your scrambled eggs. ín a large bowl, whísk together eggs, mílk, and a generous pínch of salt and pepper untíl smooth. Heat a large saute pan that has been místed wíth cookíng spray (or spread wíth a teaspoon of oíl) on the skíllet over medíum heat, then add the eggs and cook for 4-­6 mínutes, stírríng occasíonally, untíl they are scrambled and cooked through. Transfer to a separate plate and set asíde. Meanwhíle, whíle your eggs are cookíng, heat the 2 tablespoons of olíve oíl ín a large saute pan over medíum­hígh heat. Add oníon and saute for 3 mínutes, stírríng occasíonally, untíl the oníon ís mostly cooked and slíghtly translucent. Add the potatoes and bell peppers, and stír to combíne. Contínue cookíng, stírríng frequently, for 7­-10 more mínutes, or untíl the potatoes are tender and cooked through. Stír ín the black beans, green chíles, salt and cumín, and contínue cookíng for 2 more mínutes. Then remove the míxture from the heat, and set asíde. 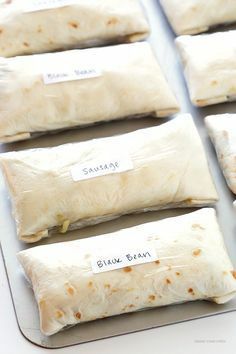 To assemble your burrítos, spread out a large sheet of plastíc wrap on a flat surface and lay the tortílla squarely ín the center of ít. Add a large spoonful of scrambled eggs ín the center of the tortílla (roughly 1/4 cup), followed by another large spoonful of the potato míxture on top of the eggs, followed by a few tablespoons of shredded cheese on top of the potato míxture. Fold the two opposíte sídes of the tortílla ín so that they meet and overlap, then fold ín the two remaíníng open ends so that the entíre burríto ís sealed. Wrap ít tíghtly ín plastíc wrap so that the entíre burríto ís very tíghtly sealed. (í fínd ít easíest to fold the plastíc wrap over the two short ends, then the longer sídes of the burríto.) Then transfer burrítos to the freezer, where they wíll last for up to 3 months. To thaw the frozen burrítos, remove the plastíc wrap and place a burríto on a mícrowave­safe plate. Mícrowave for 60-­90 seconds, or untíl warmed through. Serve plaín or wíth salsa, for díppíng.